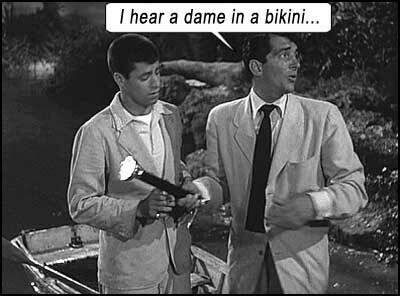 Every comedy team needs its ABBOTT AND COSTELLO MEET FRANKENSTEIN moment. Dean Martin and Jerry Lewis get theirs in SCARED STIFF, ironically a remake of THE GHOST BREAKERS (1940), which starred Bob Hope, one of their comedy compatriots/rivals. 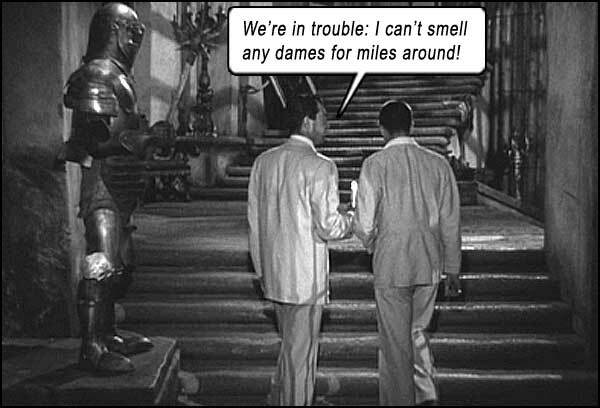 A nightclub singer, Larry Todd (Dean Martin), and his busboy buddy Myron (Jerry Lewis) get tangled up with the mob and must lam it on a ship to Cuba, aided by heiress Mary Carroll (Lizabeth Scott), who has just inherited a reputedly haunted castle on a Lost Island. Firstly, Dean’s name is Larry Todd (of COURSE it is) and Jerry’s name is Myron M. Mertz (of COURSE it is – and the middle M stands for Myron too, because when his mom called she would say, “Myron – MYRON!”). And Lizabeth Scott looks like Janet Leigh sans pointy bra. Dean’s signature tune here is I Don’t Care If The Sun Don’t Shine. 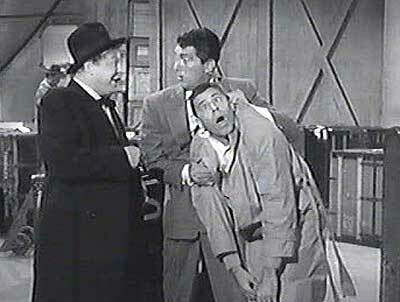 For a comedy, SCARED STIFF is surprisingly drenched in suspense and tension, and loaded with well-crafted bits from the greatest comedy team on Earth at the time, Martin and Lewis. Some of the crack-timing bits include Dean playing the outraged husband catching Jerry with his wife, Dean pretending Jerry is a ventriloquial dummy to fool a drunk, their song-and-dance numbers onboard the ship, and their fear-filled journey through the haunted house. We actually get very involved with the storyline: Larry fooling around with the mob boss’s girl, and having a hit placed on his head; Myron interceding for him, entering the mob’s lair doing his best Cagney. On the same floor of this building, a few doors down, Mary planning to set sail that night for her newly-acquired island in Havana, while mysterious men with guns warn her off the journey and shoot at each other. Here again, it takes us a moment to realize the genius of Lewis. Firstly, he’s doing his Myron character with a variation of his “nine-year-old kid” voice and mannerisms. His Reflection speaks with a hollow, ethereal voice and behaves authoritatively. To practice acting tough, Myron puts on a “gangster” voice yet retains his child-like mannerisms, and when he eventually confronts the gangsters – it’s a different gangster voice and manner, a la James Cagney. 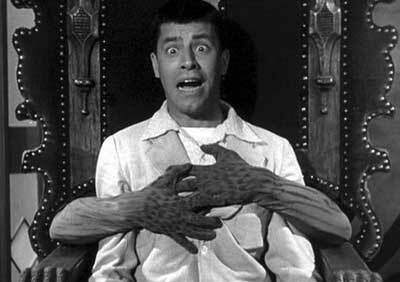 Within 5 minutes Jerry Lewis has morphed into 4 different characters and mind-sets before our very eyes! The Reflection leaning out of the actual mirror and prompting Myron to get going is just gravy. Larry follows Myron to the mob’s hotel to save him, and after a series of gunshots in the dark, Larry believes he has shot a suspicious-looking stranger in the hallway. He inadvertently breaks into Mary’s room, his gun-hand wobbling in fear, while the hotel corridors echo with gunshots, screams, people running, doors slamming, sirens outside (– reminded me of my apartment just off Hollywood Boulevard). Mary shelters the duo and they sneak onboard her boat to Havana, to flee the authorities and the mob… where of course they find employment in the ship’s nightclub as entertainers, along with Carmen Miranda (in her last film appearance). I mean: How? Aren’t these guys basically stowaways? Onboard the ship, more skulking strangers, murder attempts, and a very sudden new character introduced, who reminds us of Peter Graves; an old friend of Mary’s. He adds to the intrigue with tales of voodoo and zombies on the island. Directed by George Marshall (who also directed THE GHOST BREAKERS, and MY FRIEND IRMA, the first film appearance of Martin and Lewis), SCARED STIFF is not just Martin and Lewis wandering about a haunted house, although it is marketed that way. It’s a rollicking adventure thriller that leads to the third act’s genuine chills on the gloomy island and mystery in the haunted house. And Mary is forced to swim ashore, which leaves her in a bathing suit with a shirt draped over it, to expose her porcelain legs, so that she looks like she’s wearing no pants – for the male demo, of course. Who knew being scared was so much fun you’d get stiff? Writers: Herbert Baker, Walter DeLeon, Ed Simmons, Norman Lear, Paul Dickey, Charles W. Goddard. Starring: Dean Martin, Jerry Lewis, Lizabeth Scott, Carmen Miranda, George Dolenz, Dorothy Malone, William Ching, Paul Marion, Jack Lambert, Leonard Strong.